As usually, the transport of the fine bulk solids, such as cement, raw meal, fly ash or coal takes place for complicated conveying line routings pneumatically. It means that the bulk solid is transported with conveying air through a piping line system. The occurring friction between bulk solid and the piping line wall, and the vertical lift of the bulk solid in vertical extending conveying lines create a pressure loss of the conveying air. Consequently, the conveying air must be provided for the product transport conveying air with a plant-specific pressure. Against this plant pressure, the bulk solid must be fed into the air flow of the conveying line. For this purpose different feeding systems are applicable. In the past pressure vessel systems or screw pumps are used for this purpose. For more than half a decade, these systems are replaced by highly wear-resistant Ceramic rotary feeder type ZSV-H of the company KREISEL GmbH & Co.KG, Germany. The most important criterion for the use of KREISEL Ceramic rotary feeder is the energy saving during the plant operation and considerable wear resistance of the components. PPC in South Africa chose for their work in Hercules, as replacement of a screw pump a KREISEL ZSV-H 700 to save a power consumption of 130 kW for driving the screw pump. Fig. 1 shows the technical process of cement grinding plant. The factory Hercules PPC operates a vertical roller mill for the cement grinding. The cement is deposited in subsequent baghouse. As a shut off valve below the baghouse the output rotary feeder is placed under each of the two hoppers. It guides the cement into an airslide, that transports the material to the distributor DV22. With the help of pneumatic conveying the Duo-Cell silo and the packing plant are loaded. KREISEL ZSV-H has been installed so that it can load all three receiving points. 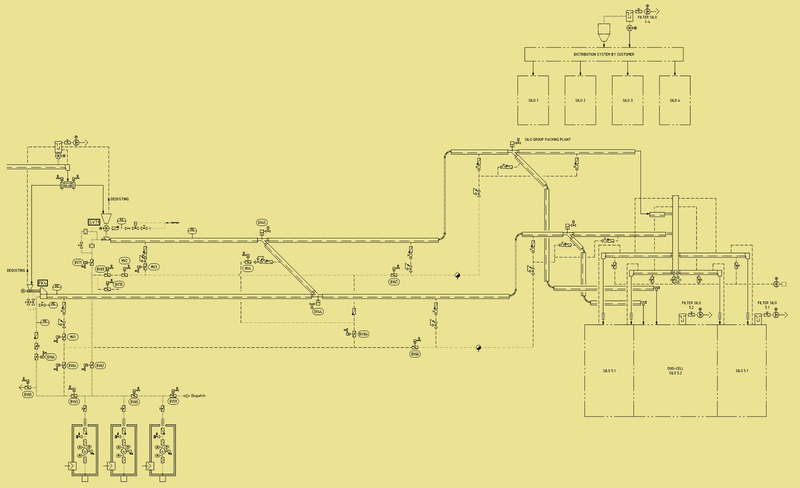 The pneumatic transport proceeds over approximately 260 m with 53 m vertical routing. The conveying capacity is 150 tons per hour. The pressure generators can be used also by the ZSV-H operation. The ceramic rotary feeder and its pre-bin were fitted into the existing plant so, that no modifications on the building construction or the conveying line were necessary. In December 2014 the KREISEL invited the plant engineers from PPC to Germany to represent the KREISEL Ceramic Rotary feeder. After detailed, constructive discussions, PPC decided to replace the screw pump through KREISEL Ceramic Rotary feeder. After 5 months of delivery time the rotary feeder was installed at the beginning of September 2015. Fig. 3 shows the KREISEL ZSV-H before the packaging at the factory in Germany. Kreisel engineered (see 3D planning extract Fig. 4) the integration of KREISEL ZSV-H in the existing plant configuration (see Fig. 5). For assembly, the existing support structures of the screw pump could be used. In a very short space of time the existing screw pump was dissambled and the Kreisel ZSV-H mounted. The plant planning was performed so that the air pipes of the pressure generators, the cement feed and the conveying capacity could be fastened optimally for the technical process. The supervision of erection and commissioning were carried out by KREISEL. After mounting the commissioning was succeeded. After the half-day cold commissioning the warm commissioning followed. The grinding plant was started with 100 t / h. After a short time the plant capacity was increased to 110 t / h. This capacity was kept constantly overnight. Over the next two days of operation the grinding throughput was adjusted to the expected conveying capacity of the ceramic rotary feeder of 150 t / h. The conveying line back pressure was adjusted to about 1.1 bar (g). During the commissioning the increase of the grinding capacity resulted in the evaluation of the results that the ZSV-H could feed min. 180 t / h of cement into the existing conveying capacity. Due to the flow-technical development of the inlet geometry of the leakage air collector KREISEL reached maximum filling degrees in the rotary feeder. Leakage air is selectively removed and thus the maximum, constant capacity is possibly. With KREISEL ZSV-H the KREISEL GmbH & Co.KG has a feeder, which reaches the contemporary customer demands with high precision. After decades of development and optimization the rotary feeders of KREISEL are already known across all industries and its reliability is proved. The ceramic lining of the product contact surfaces allows using this traditional product as feeder in pneumatic conveying systems with bulk solid. For a long time the wear, caused by flows, has been the reason not to use the rotary feeders as feeder for fine bulk solids. By using the latest ceramic elements the necessary requirements to feeders are exceeded. 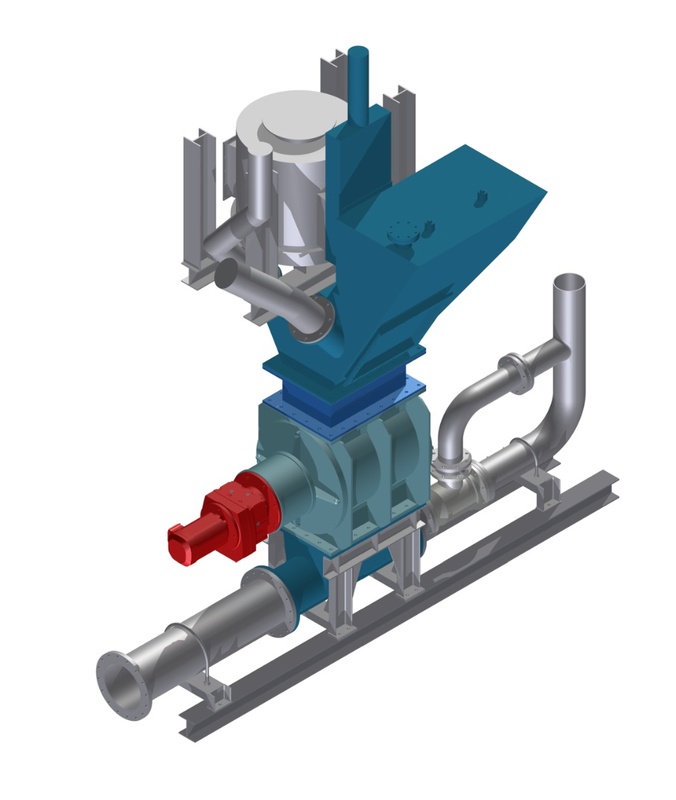 KREISEL ZSV-H can not only bring their outstanding properties to the pneumatic conveying systems, but are better than the established input systems also in service life, maintenance and spare parts requirements. In the past time the usual argument for a high energy loss because of the escaping leakage air was invalidated by the use of side plates at the rotor and by the precision of the smallest gaps. A solid construction and the grinding of ceramic elements guarantee the smallest gap and define predictable leakage air quantities. These can be compared with the energy loss of the nozzles, used in other systems. After the KREISEL ZSV-H has met the customer requirements of reliability and energy efficiency, the integration should be verified. Also here, the KREISEL ceramic rotary feeders show their thorough small footprint and low weight, and even satisfied safety officers without hesitation. Regulated space conditions and the static limits of the existing steel structure for loads and vibrations limits the room for maneuver of the manufacturers in a. On these points, the rotary feeder makes it only possible to implement the chosen customers transfer points. For the comparison of KREISEL ZSV-H with a screw pump, the functioning of the screw pump will be briefly explained with reference to the schematic diagram Fig. 6. The bulk material falls through the inlet (1) in the pump surge bin (2). This is used to draw the sealing air and the air from the bulk solids. By high speed continuous compression screw (1000 rpm) the bulk solid is transported to the outlet. There occurs a strong compression of the bulk solid. This compression is supported by a check flap (4). The compression produces a high-density bulk solid plug, which is used for the sealing against the feed conveying line pressure. The solid bulk plug falls into the outlet area of the screw pump. There, it is gathered by the conveying air and transported into the conveying line. The conveying air needs to pass in the outlet housing a nozzle, or depending on the version, several nozzles. This nozzle produces a pressure drop of about 0.30 bar and serves the conveying air and fine bulk acceleration. If with the fine bulk solids accidentally foreign bodies, such as e.g. grinding ball remains are carried, so also these should pass through the feeder. Using the example of PPC the screw pump has a peripheral speed of > 15 m / s, whereas the rotary feeder works with < 0.70 m / s. In screw pumps this can cause the breakage of the wear bushes or the end wing. In the rotary feeder, it is unlikely that these foreign bodies, especially in such a position, hit the rotor that it causes the clamps. As a rule, even the clamps cannot cause a damage of rotary feeder. The bulk solid properties of Blaine, grain size distribution, bulk density and moisture are necessary for the dimensioning of a screw pump. These parameters affect, in addition to the conveying line back pressure, the dimensioning of the motor. If these properties are changed by fluctuating processing conditions, this can lead to failure of the screw pump. Capacity losses, motor overloading and sealing problems are the results. Too fine or too coarse fine bulk solids can be fed only at low pressures (<0.5 bar), because the plug formation is insufficient. 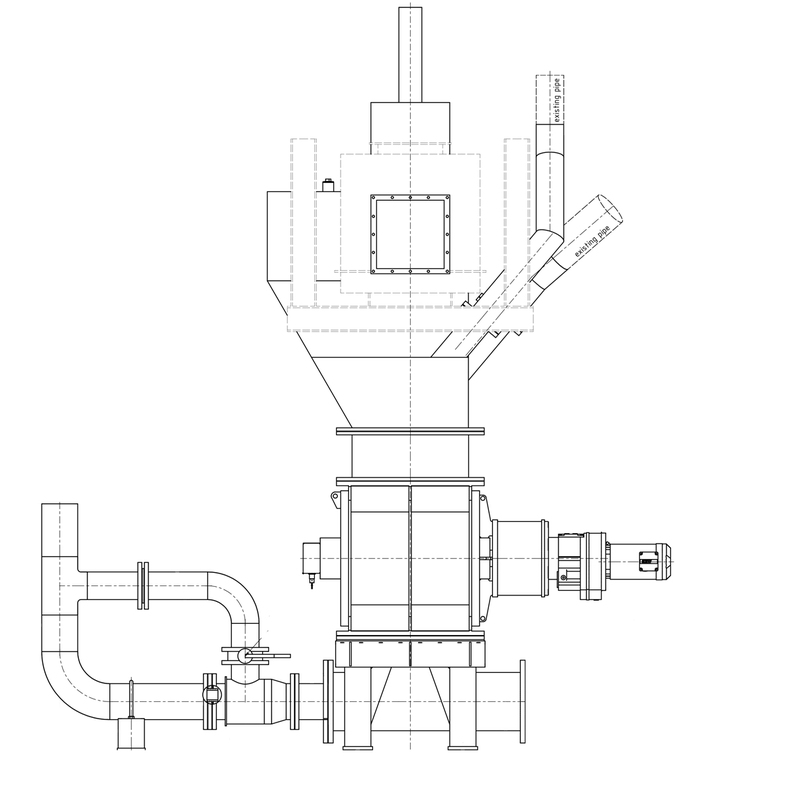 For the design of the rotary feeder, however, even the bulk solid density is crucial. The drive is exclusively determined by the dimensioning of the rotary feeder. In the plant PPC a 5.5 kW motor is installed at the rotary feeder. This absorbed capacity during the operation of less than 1 kW. To reduce the energy input during the grinding, grinding aids are used. However, these greatly change the conveying and fluidizing behaviour of bulk solids, because they influence the intermolecular forces. The experience of recent years has shown that grinding aids can also strongly influence the compression behaviour of the bulk solids. For the screw pumps this resulted in a capacity reduction of 30%. In this context, the installed 132 kW motor proves itself as under dimensioned. The rotary feeder does not produce the bulk solid compression for sealing. Consequently, the grinding aid has no negative effect on the conveying and driving capacity of the rotary feeder. If the inlet to the screw pump is irregularly and the screw pump is operated close to the capacity limit, then the coverings of the inlet area cause the capacity reducing. If the pump surge bin overloads of bulk solids, then the compressed air from the plug cannot be discharged to the inlet. The air is transported through the plug. The plug is unstable and cannot seal against the current conveying line pressure. It causes the capacity reduction. The constructive design of the inlet of the rotary feeder separates the dust removal area from the inlet area. Overfilling of the inlet leads therefore primarily to a capacity increase as to a reduction. If too less bulk solids mass flow are fed to the screw pump, so the necessary sealing plug cannot be set up sufficiently. The plug breaks and the conveying air flows into the inlet area at high speed. This acts as a sandblasting on the screw. In the ceramic-lined rotary feeders, this effect is not negative. There would be the additional option of wear reducing due to speed reduction. For the rotary feeder as inlet component is possibly: If the mass flow drops, so the necessary conveying line pressure drops too. If the conveying line back pressure drops, so the motor current consumption of the pressure generator drops too. Different, however, in the screw pump conveying: Here the influencing component is the nozzle (Fig. 6, item 9) in the outlet housing. As with any nozzle the pressure loss increases with increasing flow rate capability. If the pressure in the screw pumps conveying drops now in the screw pump conveying pressure in the delivery line, so the operating volumes of the conveying air increase. This leads to a velocity increase. The pressure to the nozzle falls significantly; however, the pressure after the nozzle falls only slightly. Thus, the lower load operation is energetic highly disfavoured in screw pumps. The wear on the ceramic rotary feeders depends on the factors bulk solid hardness, the bulk solid shape, the pressure difference over the feeder and the speed of the feeder. During the adjusting the rotary speed to the respective conveying bulk solid mass flow, the wear can be reduced. This is not possible with screw pumps. The high rotary speed of the screw shaft is required to perform the sealing function. The motor size of the screw pump depends almost linearly on the back pressure in the conveying line. This already results the motor sizes of 30 kW to 250 kW in average conveying capacities. The motor of the rotary feeder, however, is only determined by the dimensioning of the rotary feeder. 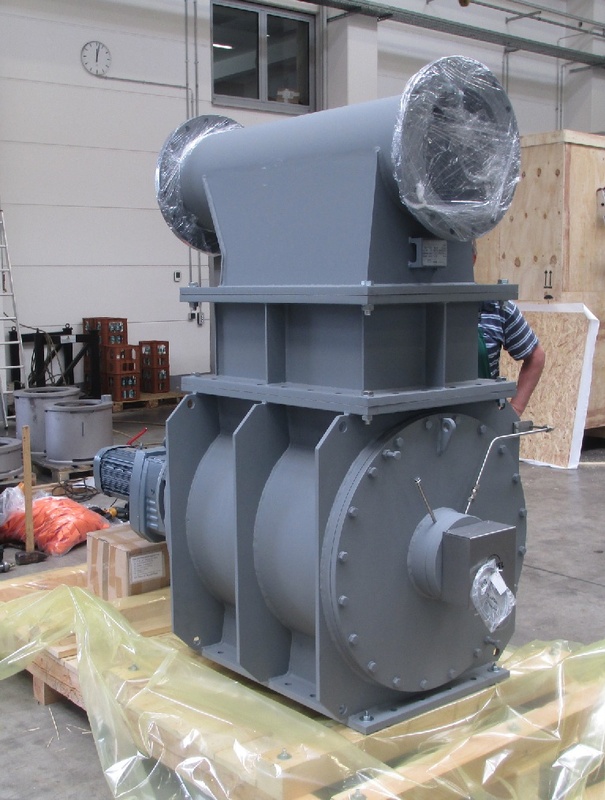 In a rotary feeder, for example, the motor has for 180 t / h of raw meal the capacity of 5.5 kW, whereby during the operating the capacity of less than 1 kW is received. Due to the relative motion of the screw pump the high compression of the bulk solid leads to grain destruction, that should be avoided depending on the industry (for example, alumina industry). KREISEL ceramic rotary feeders cause no appreciable grain destruction. Thanks to the small drive motor of the rotary feeder and the smaller pressure generator motor the MCC can be also considerably smaller and therefore more cost-effective performed. These costs may be up to tens of thousands of euros. As already mentioned in Chapters BULK SOLID PROPERTIES and GRINDING AID, the screw pump reacts to various system parameters. 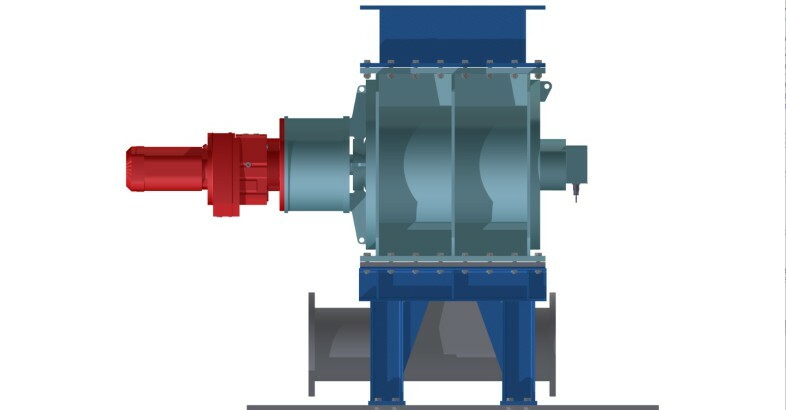 To achieve the correct screw pump configuration during the commissioning, to take into account the points BULK SOLID PROPERTIES and GRINDING AID the multiple modifications are necessary. Screw pitch, plug length, nozzle diameter or return valves adjustment must be determined in time-consuming conversion. The rotary feeder, however, does not respond to these parameters. As usually, a rotary feeder is taken into operation in one or up to two days. As a final advantage the low space requirements of the ZSV-H is listed. As you can see on Fig. 2 and Fig. 4, the ZSV-H can be nearly adapted all too all local conditions. In the case, when a screw pump has found space for installation due to pump surge bin, a rotary feeder can be installed in any case. For example, PPC Hercules builds the screw pump 4,500 mm long. KREISEL Ceramic rotary feeders require only 2,150 mm including motor. In rotary feeders due to the prevailing pressure differences the leakage air flows arise towards the bulk solid flow. These are between 5% and 12% of the total conveying air quantity. It is discharged via the dust collector. In this example at PPC the leakage air is 6,4 % of the total compressor power. 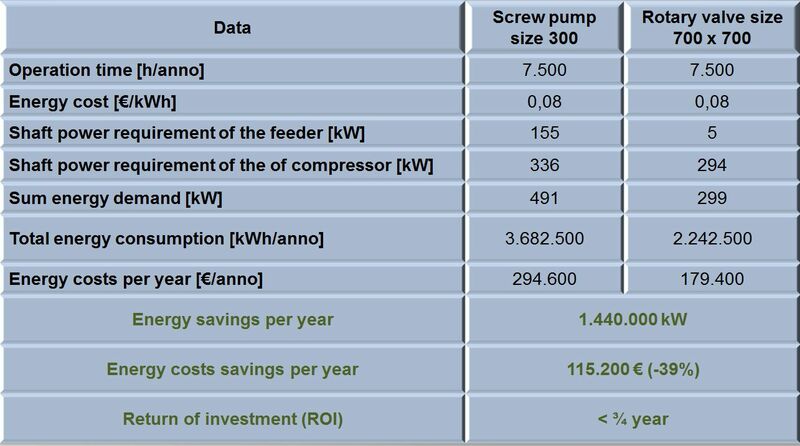 The energy loss by the screw pump nozzle is 15,5%. The conveying capacity of the ZSV-H is, according to rotary feeder length, between 0.3 up to 250 m³ / h. Conveying line pressures up to 2.0 bar can be realized depending on the bulk solid. PPC operates various pneumatic conveying systems at the Hercules location. Two of them are used to transport cement from the grinding mill to the receiving silo. 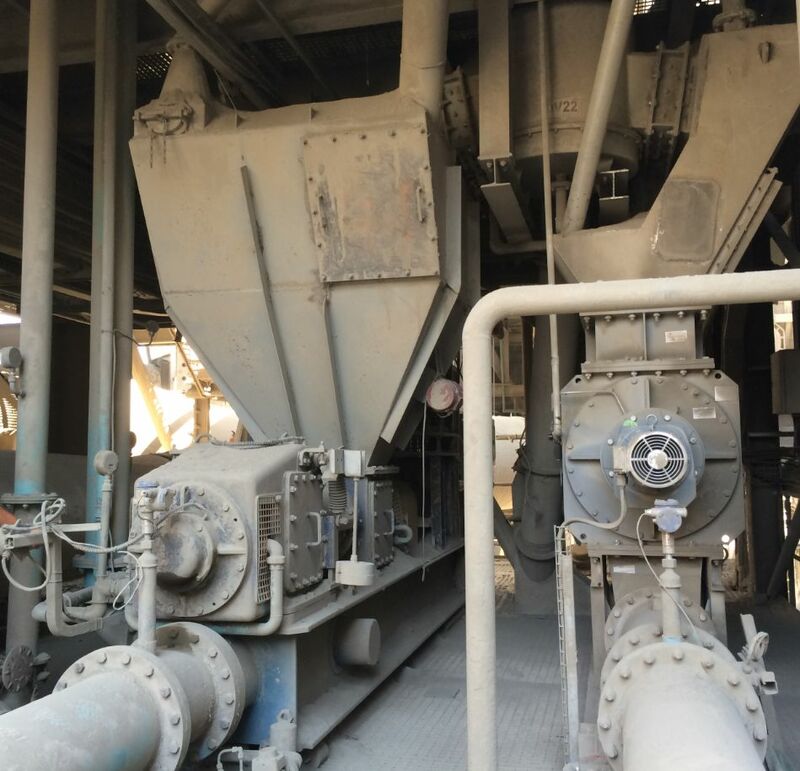 The feeding of the cement in the conveying lines was carried out by screw pumps. Repeated disturbances, capacity losses and high energy consumption gave PPC reason to bring about a technical change. PPC targets the cutting edge of the technology – ceramic rotary feeders of KREISEL Germany. Table 1 shows the system parameters of the pneumatic conveying plant with the feeding component Screw pump. The data acquisition shows a max. stable conveying capacity of 100-130 t/h, depending on the type of cement. Besides the insufficient conveying capacity there were the cases of the screw pumps failures because of various reasons. Overfilling and motor failures disturbed the operation. 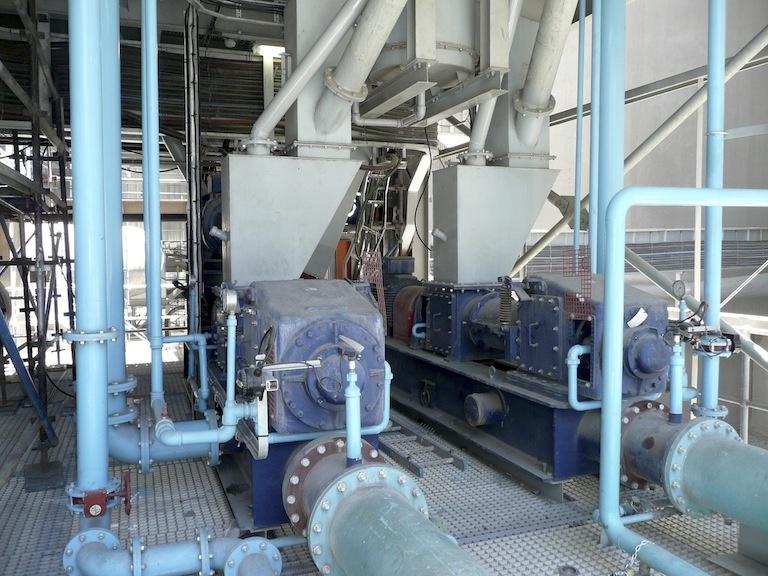 In September 2015, the reserve conveying screw pump was replaced by a KREISEL ZSV-H size 700. It was taken into operation within 2 days. During the commissioning, a stable conveying capacity of 140 t / h has revealed. Due to the optimizing the grinding and filter process the plant capacity could be increased to 175 t / h. It was found that the KREISEL ZSV-H has not yet reached its limits. The plant is for four months continuously in operation. Figs. 2a + b above show the plant structure before conversion and after conversion to KREISEL ZSV-H. The inlet was so adjusted, that the support structure could be furthermore used for the supporting the screw pump. This resulted the shortest conversion times. The driving capacity of the rotary feeder is permanently measured by the customer. Due to the special bearings, the rotary feeder is operated with a capacity of less than 1 kW. With the replacement of the screw pump into a ceramic rotary feeder a significant part of the energy costs of pneumatic conveying is saved. As a result, the return on investment amounts to less than 1 year. Due to the replacing their screw pump through a KREISEL Ceramic rotary valve PPC was able to increase its cement transport capacity at least to 175 tons per hour. Further advantages are a stable, reliable pneumatic conveying with the lowest energy consumption. An annual energy saving of approx. € 100,000 could be achieved. This is one of more than 2 dozen successful projects with a KREISEL Ceramic rotary feeder. Meanwhile, PPC ordered further ZSV-H for replacement of screw pumps in South Africa. Together with PPC KREISEL is investigating the behavior and life time of the rotary valve. KREISEL is grateful for the excellent and trustful cooperation with PPC and looking forward for more projects in terms of the energy saving.